Want Links This Year? Then Do Something! I am writing this not just as an internet marketer, but also as a consumer. One of the first great pieces of advice I ever got on internet marketing, was to do something which will draw links naturally to you, instead of linking, then hoping traffic will come. This has worked well. Scott Skinger, I believe, just won the auction for Shoemoney’s contest to wear Scott’s companies shirt “Train Signal” to the affilate summit. This was smart of Scott and he deserves a link for doing something out of the box to promote his computer training. Shoemoney always does random, fun, outrageous, cool, or controversial stuff, so deserves links. Jeremy and Dave developed their Shoemoney Tools which took a ton of work. That deserves a link! These guys took me and my wife on a private tour of yellowstone today, animals, geysers, wilderness, the whole shot! and gave me one of the best days of my life. They deserve a link too! So go out, and get yourself a picture of you, your wife and a buffalo while wearing pseudo moto-cross snowmobiling outfits, and you might just get a link too! Happy link building this year! And as a consumer, stop giving me a bunch of crap on the internet that is just ads, and give me something interesting to read, o.k.? 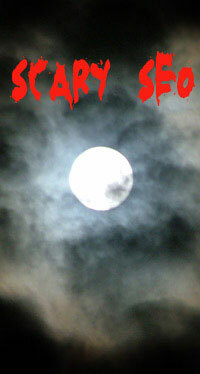 Scary SEO – Go Dave! October 24th and 25th will be Scary SEO in Florida. It is near Halloween, so hence the “Scary” part! I am proud and impressed with Dave Snyder for dong this. Putting on an event like this requires a huge burst of confidence, because you never know if anyone is going to sign up! And whether they do or don’t you have committed to a bunch of money and time. It sounds like it is going to be a very casual, small event focused on SEO. My good buddy Pamelund, is going to make her public speaking debut there. I predict that a lot of people will be shocked at how incredibly deep her knowledge goes in SEO. Most people would have no idea that she spent years managing over a 100 people building and SEO’ing websites. She is mostly known for, “Wow, she’s hot!”, and then about 2 hours later the person is writing notes and asking her questions. I expect when she speaks most of the “guys” in the audience will quietly say to themselves, “wow she’s hot”. So tip to Pam, don’t say anything of significance until about 1 minute into your talk because they will still be checking you out. If you knew Dave’s backstory, he has faced obstacles as big as the ones myself and Shoemoney have. I will let him tell his own story though. There are a bunch of good people signed up for the event, it’s in Florida, and it definitely is not your typical SEO event. It only costs $200 to attend. Unless my math totally tanks it looks like they have room for about 10 more people. Good job Dave! Rock on! And have a scary time! 5X Heavyweight Champion Says Vegas – You Hit the Road! Internet Marketing can take you places. Places you never dreamed of. Most of what I have done has been to do well in Google, so I have followed the Google Sensei Matt. He has led me on the path of do first, write what you do, then others may link to you. As a result of this, I try to do things, especially things that help others, even if only to make them happy. My other teachers like the old Chinese Monks in the Temple, Stefan Juhl, the Mad Hat, Mr. Shoe, Pamelund, and others have taught me other ways to view the same elephant. The poker tournament is coming up in November at Pubcon. Today was crazy with all the e-mails going back and forth with the Venetian hotel, dealing with everything from Security to what I can do for the sponsors, to how we can get enough food and drinks for the players and guests. This weekend, for reasons I can not yet disclose, I am going to Vegas to meet up Mr. Shoe himself. On Friday Jeremy and I are going to the Xtreme Couture Mixed Martial Arts Gym to meet with Ryan Couture the son of Randy Couture. Randy is the 5X world champion in mixed martial arts. He has been the world champ in two classes. 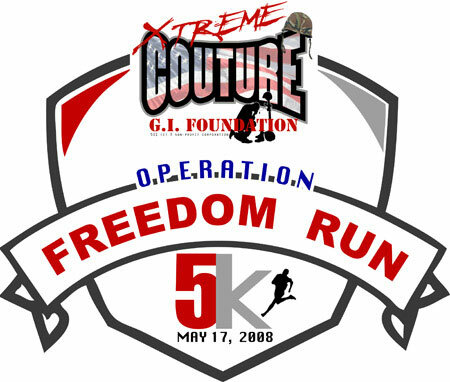 Jeremy is the main sponsor of their charity 5K run to raise money for American Veterans who have been severely injured. I am not a huge fan of any war, but as an American, and a friend to many warriors (meaning Soldiers, Marines, Sailors, and Air Force guys), I take responsibility for the actions of our country even if I don’t agree with those actions 100%. I am very proud to help support Randy’s charity, which is doing some real good, for some guys who gave it all for us, and are now being asked to give it all every day for the rest of their lives as a result of what they lost. On Saturday during the run, Jeremy and I are scheduled to meet with Randy Couture, 5 time Heavyweight Mixed Martial Arts Champion of the world. So here I sit, writing my blog, tomorrow night I pack, and then on Thursday night I am off to Vegas, to meet up with Jeremy (Shoemoney) Schoemaker, and Randy Couture, the heavyweight champ. This Internet Marketing Stuff really can take you places, huh? I don’t know exactly what to call this group, other than the folks in the internet marketing world that have befriended and helped me. You guys have been most excellent! Thank you all for sending me the info I asked for. Thank you all for caring enough to bother and not dumping my request in the spam bin! It is a hell of thing to get that many responses from so many people that I think so highly of, and respect so much! I’ve got a couple of things brewing, and I will be asking for more information shortly to deliver you exactly what you want! For the moment, just a big thank you for what was one of the more enlightening, and fun days of my life! If you don’t know what I am talking about, then make sure to come to the poker tournament this year, and get on the list, and then you will be in the loop! Elite Retreat End of Day 1 and Open Source Dim Sum Baby! I will be writing about the Elite Retreat hopefully later tonight, but if you have anything to do with SEO or Internet Marketing and you read this you are invited to Open Source Dim Sum on Saturday! In one line though today I got to sit next to one of my hero’s Matt Mullenweg all day, got to hear him, Neil Patel, Andy Liu, Aaron Wall, Brian Clark, and of course the hero of hero’s Jeremy Schoemaker. This event is so worth 5K per pop it aint even funny. o.k., so it was three lines, not one. Open Source Dim Sum Saturday, April 5th, 2008 at 10:00 A.M. I have confirmed some very, very, big names in SEO, eating little funny looking food served from steaming carts! The restaurant said we will probably have to wait about 15 or 20 minutes after we get there. This is an authentic Chinatown experience. If you didn’t see all the white faced SEO boys, (except for us ethnic looking types) you would think this was in Hong Kong. I have not eaten at this particular Dim Sum place, but in Zagats it is ranked highly for the Dim Sum places in China Town. This will be the first ever SEO Dim Sum event! This should be a real hoot. There has been a big 0 into planning this event, and whatever happens will be my responsibility! It is not an actual official Elite Retreat event, but Jeremy told me he did not mind me having it. It will probably cost around $20 per person, and I suggest you bring cash. I was at the event to help Jeremy take care of little details, but what I got out of it was worth millions. First off here is the main line up. How would you like to sit in a room with Andy Liu, Dave Dellanave, Jeremy Schoemaker, Brian Clark, Neil Patel, and Aaron Wahl, who are all there to answer any question you can throw at them? Once during the event I heard someone say, “I’m sorry but I can not tell you that information.” Other than that, I heard every question asked get answered. I heard dollar amounts. I kept getting confused as to what 7 figures meant or 8 figures and had to keep re-working it out in my head. I actually felt guilty because I went to the event to help Jeremy, and felt like I took way, way, way, more away from the event than I gave. 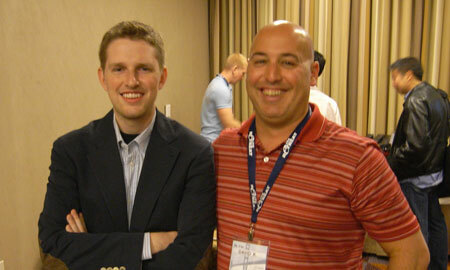 Matt Mullenweg who is the main founder of wordpress and Automatic. I always try to link to him, because he has very few links going to his site. You can see the stars in my eyes standing next to Matt. Guy Kawasaki also came and spoke about his new site he is setting up. The Elite Retreat really lived up to its reputation and promise of giving people full access to superstars of our profession. The amount of intelligence that was in that room was mind boggling. The attendees were thrilled with the result. I got some great video, met amazing friends, and the food was unreal. I will be writing more about it, but first I have to go meet a bunch of the crew for dinner. Last night Jeremy treated us all to dinner at Aqua, which is one of the best restaurants in San Francsisco. I have a little insight into the finance of the whole event, and it was an amazing gesture of Jeremy to buy a very expensive and world class dinner for so many people. And if you run into Neil, ask him about the Cherries in the dessert. They were his absolute favorite, and he kept forcing them on everyone. One of my goals in this event was for me to work closely with Shoemoney so I could get a sense of who he really is. My conclusion? Brilliant, generous, ethical, and a guy who surrounds himself with the best and brightest. He has my full support. Gotta go get ready for dinner, pick up my wife and see what she bought shopping today, and then we are off to Anamandara with the crew! Thanks to all the attendees, the speakers, and especially Jeremy for letting me into this privileged world for what was truly and Elite Retreat! Tonight, Friday’s dinner is at Anamandara! This post is about Friday nights dinner. This is not an official Elite Retreat event. The post about breakfast on Saturday is here. Everyone is invited. Dinner is at 9:00. They have a gorgeous bar where you can hang out before, during or after. AnaMandara is right by fishermans wharf and Vietnamese / French fusion. It is a lovely place. It is taxi distance from the hotel. It costs about $40 per person. Here is the google local map. Some of the guys are meeting by the entrance of the hotel at 8:30 to take a cab. Leave a comment if you are coming! Jeremy “Shoemoney” Schoemaker is holding his Elite Retreat in San Francisco right this second. I have the honor of helping out at the event. I get to run the cam-corder, buy more beer, in fact I have even given chiropractic adjustments to a few of the guests. Jeremy knows how to throw an event. The hotel is unbelievable. It is first class. It opened a month ago, and I think my wife and I are are the first people to sleep in our room. Jeremy had limos out to pick up the guests, and had a great spread with drinks and snacks for everyone tonight. What was going to be a little cocktail get to know each other networking event turned into a full blown party. I had the honor to meet each of the guests who arrived tonight. I did not know what to expect, and actually wondered about who would come. I was thrilled to run into some old friends. To speak straight truth without holding back, one for one, they were some of the nicest people. I would be thrilled to hang out with any of them any time. There was not a single jerk in the crowd. It was great to see what a first class crowd that Jeremy draws. I am not at liberty to give out the details of what I learned in private conversations tonight, but I will simply state that the deals, and action people were talking about left my jaw hanging down, and me speechless. Everyone there was open and interested to meet and help everyone else there. The official event has not even begun yet, and I am not even a guest, I am a helper, and what I got out of it was way, way, way worth more than $5,000. If you were on the on the edge about whether to come or not, you should have :), and I highly recommend you do next year. If you are an attendee this week please ask me for anything you need. I am here to help you guys, so whether you feel like a pizza, need a chiropractic adjustment, need cleaner for your contact lenses, just let me know and I will take care of it. Jeremy, if you read this, again thank you for your welcome introduction into your truly elite, and magnificent world! Stay tuned for more stories and pictures as this event unfolds! Matt Cutts thinks he is skipping April Fools? Go here, De-Sphunn Matt Cutts Blog. Then Click on De-Sphunn to make it the most De-Sphunn article ever!! If you don’t do this you will have bad April Fools luck and people will be playing tricks on you all day!!! 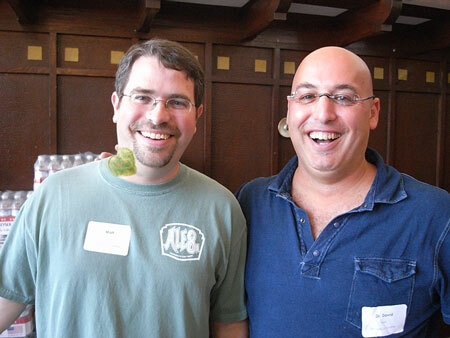 Want to see Matt Cutts tattoo? Here is a picture of his Cat Tat. I think he may get tired of it. I use a blackberry. 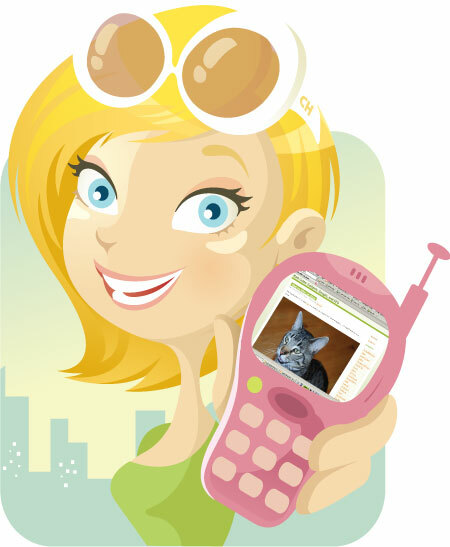 I often find myself waiting for someone or something, so I go to my phone to catch up on blogs. I want to create a list of SEO related blogs you can read from your phone. Give me the ones you like for the list! These are ones that came immediately to mind in no particular order. I would love you to list any you like to read on your phone, or your own if it is phone ready, and if it is SEO related, and not just junk I will add it to the list. If this get’s popular I will move it to a page instead of a blog so it has a shorter URL in the future.